We develop OTT and PayTV services to fix all kind of projects: from corporate video sites to digital TV migration of cable operators. Our solutions are self made, based in our own R&D projects and technology, and the reliable support of world best technology partners. This features and our own CDN infrastructure help us to follow our philosofy: flexible solutions made simple! OTT (over the top) systems have opened a new frontier of distribution and the floodgates of new competition. While pay TV has long been a restrictive competitive market in most developed nations, OTT push towards for a new space that has increased competitive pressure. Companies around the video ecosystem as well as many non-traditional players are launching their own OTT services, each hoping to establish its position in the future of the video industry. Tmira has developed its own OTT and Online Video platforms to be adapted to the current needs of the viewer and broadcasters. 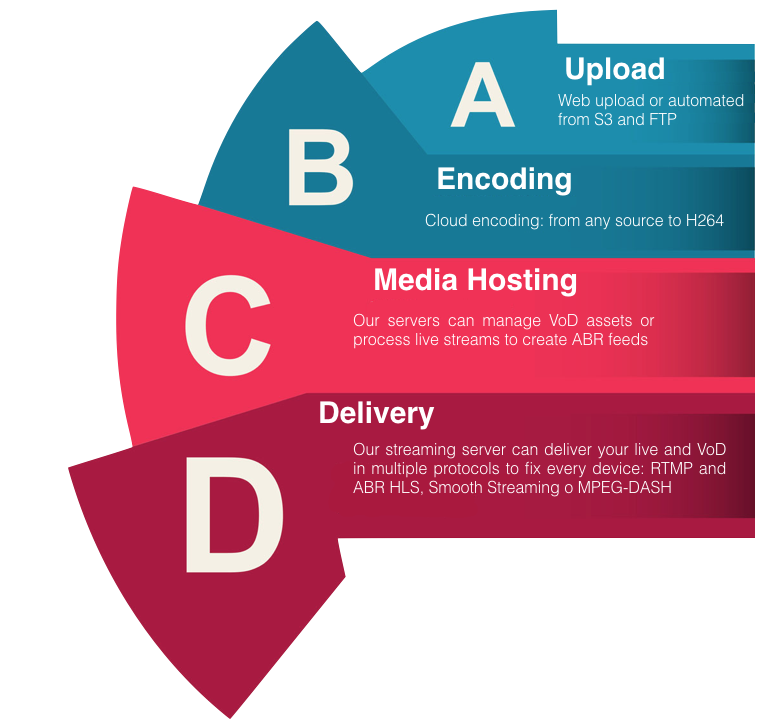 CDN or Content Delivery Network is a server infrastructure able to host your contents and deliver them to an heterogeneous audience in the most efficient and fastest way, no matter which device your user is watching or what kind of Internet connection is using. 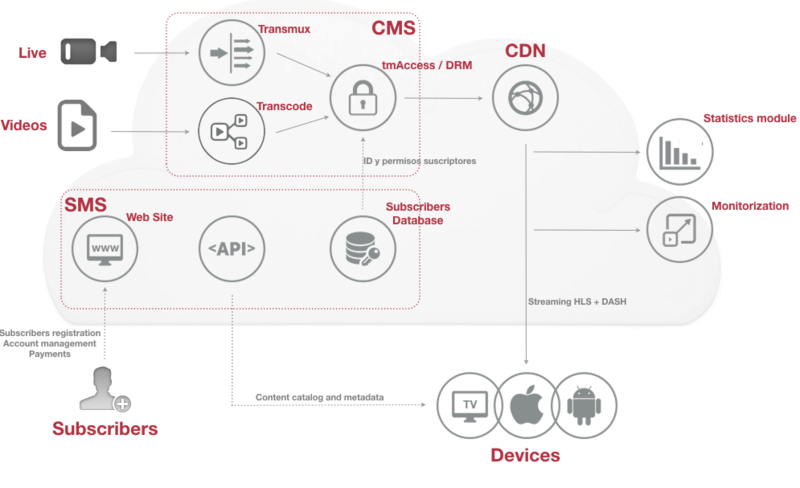 Tmira developed its own video streaming CDN with a multilayer (origin/edge) topography and based in award-winning streaming software partners. 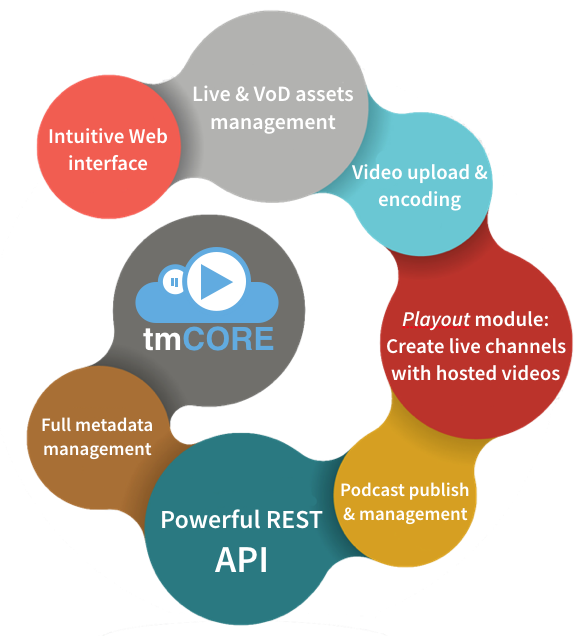 tmCore is a comprehensive solution for storage, management, syndication and publication of audiovisual content. tmCore is formed by a back-end that can handle and accommodate HD video and a front-end that allows administrators to manage all tmCore functionality, and users enjoy a full multimedia portal. tmCore is our commitment to provide a powerful, elegant, and highly customizable CMS tool. And easy to use and manage. Integration with third companies tools like Google Analytics, Akismet comments automatic moderation or Facebook as social comment tool allows tmCore to offer the functions you offer rarely have seen in other CMS and video publish tools . And if you do not want to use self-generated video site, do not worry. Use it as a backend of your own portal. You can still enjoy the functions and administration, while your new portal draws on the videos and content thanks to tmCore standardized API. If you need more information about our CMS, or wanna try, do not hesitate to contact us.